Evan Smith (Flinders University) and Matthew Worley (University of Reading) are considering chapter proposals for a second edited volume on the British far left in the post-war era (1945 to the present). Or any other aspect of the British far left if suitably interesting. Please email either editor with any further questions. Details of the first volume, Against the Grain: The British Far Left from 1956 (Manchester University Press, 2014), can be seen here. Tomorrow is the 43rd anniversary of the establishment of the Aboriginal Tent Embassy outside (Old) Parliament House in Canberra. This post is about how the Tent Embassy challenged the protest laws enacted by the McMahon government the previous year, which sought to quash dissent outside the house of Federal Parliament. 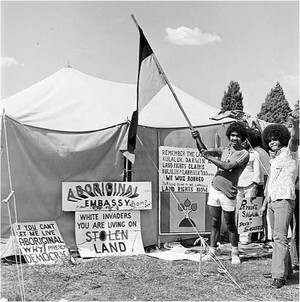 The McMahon government believed it had the necessary powers to deal with the protest movement that had developed since the late 1960s, but the Tent Embassy demonstrated that political protest was a much more fluid concept and one that puzzled the Liberal-Country government. Part of this post will be in a forthcoming article on the Public Order Act 1971 and the policing of protest in Canberra in the 1970s (which should be available later this year). In May 1971, the McMahon government introduced the Public Order (Protection of Persons and Property) Act 1971 (Cth) to police the growing protest movement in the nation’s capital and to prevent ‘violent’ demonstrations outside (Old) Parliament House, as well as outside the US, South Vietnamese and South African embassies. 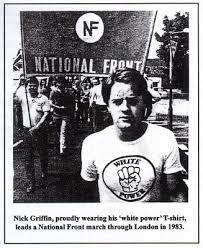 A week after the Act was introduced, it was used against an Anti-Apartheid and an anti-Vietnam War demonstration, and then in July 1971, when people protested against the Springbok rugby tour coming to Manuka Oval. At these three demonstrations, hundreds of people were arrested for violating the new Act. Despite this seemingly successful application of the Public Order Act in 1971, the McMahon Government soon found that itself debating whether it had the necessary legislation to combat other forms of protest. 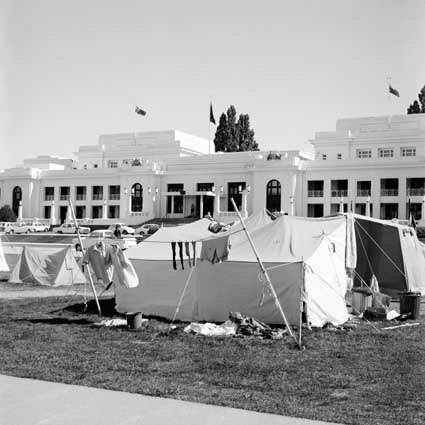 On Australia Day 1972, a group of Aboriginal activists, having travelled from Redfern in Sydney to Canberra, erected a camping site on the lawns outside (Old) Parliament House and established the Aboriginal Tent Embassy. The purpose of the Aboriginal Tent Embassy was to advocate for land rights against the limited measures introduced by the Liberals since the 1967 referendum[i] and to protest against remarks made by the Prime Minister concerning the ‘assimilation’ of Australia’s Aboriginal people on Australia Day. [ii] As Scott Robinson wrote, the Embassy protestors ‘demanded retraction of the Australia Day statement [by McMahon] and compensation for stolen lands, and warned the government that the embassy would stay until these demands were met.’[iii] As the Embassy gained attention from the media, other protest groups and even the diplomatic staff on some Soviet Bloc and non-aligned countries, the Government debated over what action to take to remove the protestors from their site. In March 1972, the McMahon Government started drafting amendments to the Trespass on Commonwealth Lands Ordinance 1932 that would remove the exception of Aboriginal camps from the legislation and by the end of June, the Trespass on Commonwealth Lands Ordinance 1972 was created that made it illegal for a person to camp or erect a structure on unleased land, owned by the Commonwealth. [x] Believing that this Ordinance was now in effect, on 20 July, 1972, the police removed the structures of the Embassy and eight protestors were arrested. Scott Robinson claims that Police Inspector Osborne ‘made several announcements over the megaphone, warning the protestors to move away from the tents, and advising them that “if you fail to move you may be arrested for obstructing police”’,[xi] but does not say whether this was an invocation of the Public Order Act. 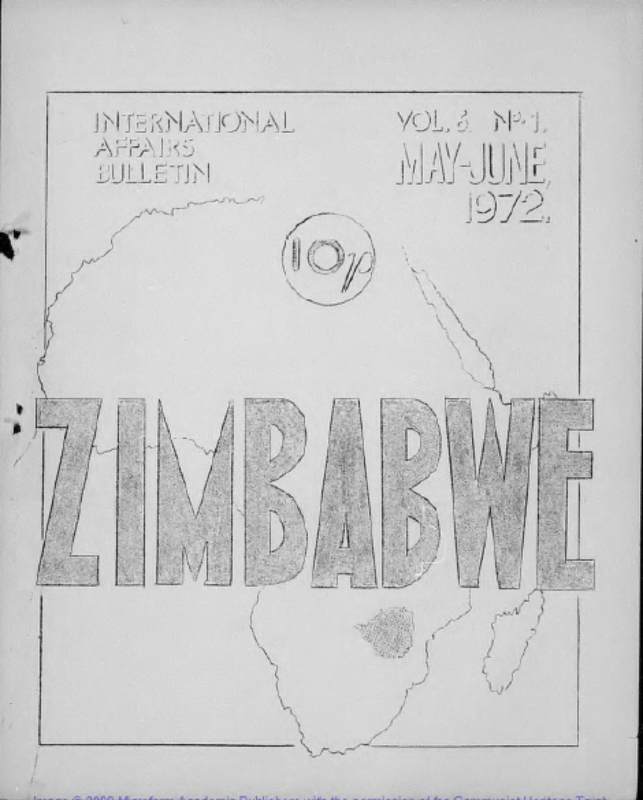 This is the second part in a three-part series of blog posts about the Communist Party of Great Britain’s relationship with the national liberation struggle in Rhodesia/Zimbabwe between 1965 and 1979. This post focuses on the Pearce Commission in 1972 and how the Communists used it to publicise its opposition to the Smith regime. Cover of CPGB’s International Affairs Bulletin from May/June 1972. After the Smith regime in Rhodesia announced its UDI in 1965, the Wilson government had pursued a line of not recognising the country’s independence before the breakaway nation implemented majority African rule (NIBMAR or ‘no independence before majority African rule’), although there were several attempts at negotiations to try to achieve this compromise. However the Smith regime was unwilling to negotiate with the British under these conditions. In 1970, the Conservatives were surprisingly elected to power and Edward Heath became Prime Minister. Under the watch of Foreign Secretary Alec Douglas-Home, Britain tried to re-engage with the Rhodesian government and made overtures to the Smith regime on a much more conciliatory basis. This warming of ties between Rhodesia and its former colonial superior led to the establishment of an inquiry into the state of affairs in Rhodesia and the treatment of its African population led by Lord Pearce, which became known as the Pearce Commission. Because the leadership of both national liberation forces ZAPU and ZANU were both either in exile or in jail, supporters of both organisations came together to help establish the African National Council, which was to act as the representative of the country’s African population to the Pearce Commission. While both organisations helped form the Council, it seems that it was supported more forthrightly by ZAPU (and thus the Soviet leaning communist movement worldwide). The ANC was formed in December 1971 as a spontaneous grass-roots reaction to the announcement of the terms of the Anglo-Rhodesian proposals. Although having a formal structure it represents the demands of African people in the country to express their view as to the terms of the Settlement. It is clear in spite of the diplomatic language used, that there was obstruction by the Rhodesian authorities of the work of the Commission which even cancelled visits to certain areas at the request of the authorities. On the arrival of the Commission there were demonstrations, especially in the urban, working class areas which were fired on by the police. The obstruction by the Rhodesian authorities also extended to denying visas to people coming to the country to take part in the investigation, including Sir Dingle Foot who was to take part on behalf of the National Executive of the Labour Party. This gave the International Department of the CPGB an idea to take advantage of the Rhodesian government’s obstructiveness and possibly make some publicity for the Zimbabwean cause. Documents to this episode can be found in the National Archives at Kew in the file FCO 36/1331. we are informing you of our proposed visit, since we would like to have an assurance from the British Government that it will take the necessary steps to ensure that no obstacles are placed in the way of our delegation. There is no question that the Rhodesian authorities would be prepared to admit a Communist Party delegation. There is no Communist Party in Rhodesia and any attempt to form one would almost certainly be banned under existing legislation. * Nor could the Communists in any way be involved with the proposed all-party mission which would, of course, comprise those parties now represented in the House of Commons. If, however, we were to refuse even to notify the Rhodesians of the Communist Party’s proposal it would enable them and, no doubt, the Russians and others, to make some cheap propaganda at our expense. Mason recommended that the FCO tell the Rhodesian regime that the CPGB intended to send a delegation to the country, but would tell Gollan that ‘control of access to Rhodesia is in the hands of the Rhodesian authorities’. As has been made clear in the course of debates in Parliament, control of access to Rhodesia has in practice long been in the hands of the authorities there. The British Government is therefore not in a position to give the assurance you request. 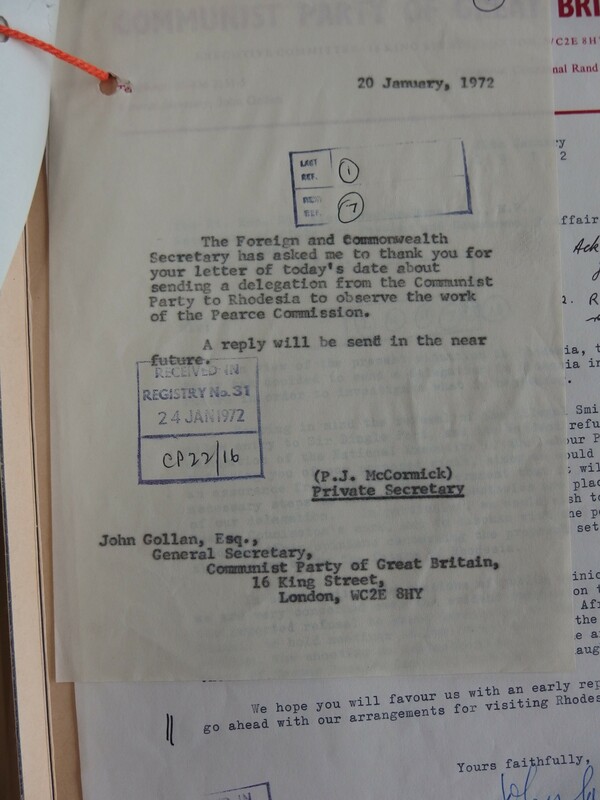 At the same time, the Douglas-Home sent a telegram to the Rhodesian authorities informing them of the CPGB’s request and the FCO’s response to Gollan. Gollan replied to Douglas-Home that he was ‘shocked’ at the Foreign Secretary’s reply. Gollan complained that the procedure followed by the government concerning delegations of Labour and Liberal Party members was not followed when it was Communist Party members. Gollan complained ‘you appear to be discriminating against us’. the Communist Party proposes in effect to conduct its own test of acceptability, whereas the Labour and Liberal Parties agreed merely to observe the Pearce Commission in operation. The Communist Party know, of course, that they have no hope of being admitted into Rhodesia and are clearly seeking to exploit the situation for propaganda purposes. The FCO sent another letter to Gollan outlining these reasons, but offered the conciliation that if the CPGB were intending to send a delegation to Rhodesia, a list of names of those intending to travel was needed so that the FCO could forward them into Salisbury. Gollan quickly replied that both himself and Jack Woddis, head of the Party’s International Department, would form the two-man delegation. Another internal FCO memo said of this request, ‘Clearly there is no chance of the Rhodesian authorities admitting them to Rhodesia’, but conceded that they would communicate the Communist Party’s wish to the Rhodesian government. I have been unable to locate any information on what happened after this exchange and haven’t been able to access the Morning Star or Comment from 1972 to see if any publicity was made from the Party’s attempt to send a delegation to Rhodesia. But it shows how affairs in Southern Africa (including national liberation struggles) were important for those fighting the Cold War and that any possible involvement of communists (from Britain or the Soviet Bloc) had to be taken seriously by the FCO. It also shows that the CPGB’s attitude towards the national liberation struggle in Rhodesia was changing. While the British party followed a line of no negotiation with the Smith regime (as pronounced by ZAPU) during the 1960s, when ZAPU co-operated with the Pearce Commission, the CPGB followed (although the armed struggle was intensified at the same time). At this moment, Rhodesia/Zimbabwe seemed like the weakest link in the capitalist-imperialist chain in Southern Africa and the ‘facts on the ground’ in 1972 meant that the CPGB, following ZAPU and the Soviets, attempted to exploit the Pearce Commission to put public pressure on the Smith regime. The next post will look at how the Communist Party reacted to the victory of the national liberation forces in Zimbabwe in the mid-to-late 1970s and how the Party reacted to the negotiated settlement achieved by the British Commonwealth between 1977 and 1979, but also to the fact that Robert Mugabe’s ZANU was the leading force in post-imperial Zimbabwe, rather than the Soviet-backed ZAPU. In July 1966 Mr Lardner-Burke announced that preparations were being made for a Suppression of Communism bill to be placed before the Rhodesian parliament. As far as the two Research Departments can tell, no such bill was introduced and it is thought the reason for this might be that the Rhodesians decided that they had sufficient powers under the Unlawful Organisations Act and the Law & Order Maintenance Act to make a Suppression of Communism Act unnecessary. All are welcome. I won’t be attending as I am in Australia at the moment. But Matt will be tackling the hard questions for both of us! It’d be awesome if you could all attend. With hindsight, the idea of winning the Labour Party as a whole to socialism may seem naïve but it is not clear that Trotskyist groups have been more successful. Even now, if I had to predict what was more likely, a socialist turn in the Labour Party or a revolution guided by a vanguardist party modelled on the Bolsheviks, I would hesitate. Overall, this book suggests that the British far Left is strongest when it engages with broader movements, and that a keen sense of its own limitations would not hurt. Did the Thatcher Government downplay fascist infiltration of football ‘hooligan’ scene? At many football grounds, particularly in the London area, youngsters giving Nazi salutes have adapted BM slogans to their football chants – ‘Adolf Hitler, we’ll support you evermore’ and ‘There’s only one Adolf Hitler’. 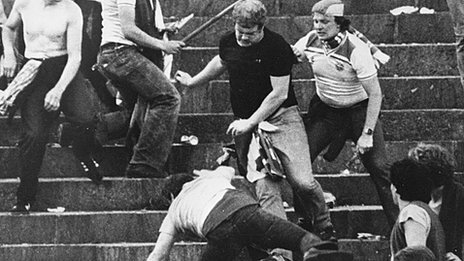 In the recently released documents from the Prime Minister’s Office for 1985-86 by the National Archives, there were several files relating the policing of football crowds and of ‘hooliganism’ in the wake of the Heysel disaster in Belgium, the Bradford City fire and the riot at St Andrews (Birmingham City’s stadium). These files offer a great insight into how the British government, particularly the Home Office, and the various police forces around the country viewed football crowds as a ‘problem’ and the various ways it sought to deal with them (of course, this offers background to how the authorities mishandled the Hillsborough disaster four years later). Sociological research on the activities of the politically far right at football matches suggests that many young fans who espouse racist views, or who join in racist chants, have little real idea of the politics of groups like the National Front and the British Movement. Although Justice Popplewell admitted, ‘I shall need to inquire more deeply in due course into this aspect’. During the season just concluded, I have not detected any political lobbying adjacent to the ground on match days. I have not detected political activists recruiting or provoking problems. It is difficult to measure the effect which the presence of political extremists has on the level of crowd violence, but we do not rule out the possibility that this is a contributing factor. Anyone with evidence that political extremists are inciting or organising violence at football matches should draw it to the attention of the police. Included in the file are examples of the fascist literature from the Young National Front’s paper Bulldog, which featured a regular column ‘On the Football Front’. Although prone to exaggeration, one issue claimed that Bulldog was being sold ‘by the hundred outside football grounds’ (including St Andrews). Another issue of Bulldog claimed that a YNF organiser had been involved in a ‘football race riot’ in Birmingham. You will realise, of course, that if anything is to be done to deal with specific instances of violence being initiated or encouraged by National Front members, the police will require firm evidence; the Home Secretary has asked that anybody who has such evidence should make it available to the police. Without such evidence, it is very difficult to take any action, however horrible we feel this overt racism to be. While the authorities were concerned about football ‘hooliganism’ and violence during the 1980s, the emphasis was on crowd control, rather than tackling political extremism (particularly far right/fascist). This is very similar to how the authorities policed clashes between fascists and anti-fascists in the 1970s and 1980s. The police were often willing to downplay fascist violence until it became impossible to ignore. The policing of football crowds and demonstrations were revamped shortly after this with the Public Order Act 1986, but as the events at Hillsborough in April 1989 showed, public order policing strategies were still framed around suspicion of crowds and little concern for those caught up in them.